Modified recipe from Cooking on the Weekends to be easier, vegan, and non-gluten-free. 1. Preheat your oven to 350° F and get a 4½” x 8” loaf pan ready. The original recipe calls for lining your pan with parchment paper, but if your pan releases very well, you’ll be fine without lining or greasing it. 2. Peel two of the lemons and set the peels aside. Slice all of the lemons as thinly as you can. 3. In a blender, combine the flax, water, olive oil, vanilla, salt, ½ cup of the sugar, and the peels from 2 lemons. Blend until smooth. 4. In a medium sized mixing bowl, combine the almond meal, flour, baking powder, and baking soda. 5. Sprinkle 1 tablespoon of sugar over the bottom of your pan, and line the bottom and sides of the pan with lemon slices. Along the bottom of the pan, arrange the slices to overlap. For the sides, cut lemon slices in half so that the flat edge can rest on the bottom of the pan. 6. Fold the blended mixture into your dry ingredients until batter is smooth. 7. Carefully spread about half of the batter in the lemon-lined pan, add another layer of lemon slices on top of it, and sprinkle another tablespoon of sugar over the lemons. Spread the remaining batter over the top. 8. Bake at 350° F for 30-40 minutes, until the top is starting to brown and crack, and the cake doesn’t jiggle when you move the pan. 9. Let the cake cool for 20 minutes before covering the pan with a serving platter and inverting it to remove. Let it cool for another 45 minutes or so before slicing. 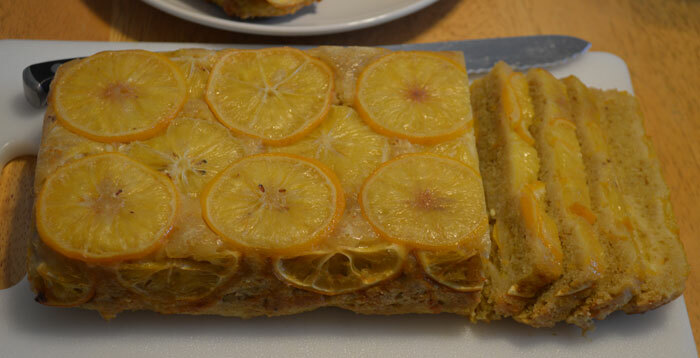 One Response to "Meyer Lemon Olive Oil Cake"